If you or a previous owner haven’t already remodeled, then your bathroom probably doesn’t have anything beyond the basics: a toilet, a bathtub or shower, a sink with just enough room underneath to store a couple things, and a mirror. 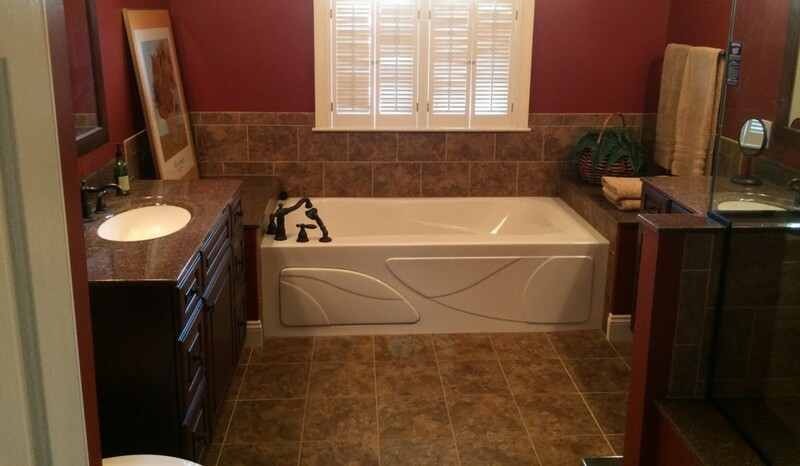 The floor is nothing but linoleum, the walls are plain white, and assuming you’re lucky enough to have a tub, the material is nothing finer than plastic or fiberglass. When you’re in your bathroom, you’re always doing something that takes up your time and doesn’t always feel like it’s worth the effort you put in. By turning this room into a beautiful space, by covering the floors and walls with tiles and improving the cabinets and the bathtub, you can give it an identity that goes beyond the essential activities you perform in it. Now the trip is worthwhile simply because it gives you the opportunity to take in some gorgeous surroundings. Beautiful bathrooms are even more important if you take baths, or else a remodeled bathroom could be the excuse you needed to start taking baths. After all, when you’re in the bathtub, you’ve got perhaps half an hour to spend soaking in water and doing little else, so why not surround yourself with beautiful furnishings? Bathrooms are often stuffed into awkward corners in the building, either to make it easier to run the plumbing through or else to make it easier to forget that our bodies have certain necessary functions we can’t ignore. What this means is that bathrooms are often cramped, narrow, and occasionally awkwardly shaped. Even if beauty isn’t your top priority, you could still benefit from remodeling your bathroom. There often isn’t enough space in the bathroom to keep all your toiletries and all the other medications and face and body care products you need, and you can get this extra space by adding shelves or cabinets to the side of the mirror, above the toilet, or even in the bathtub or shower itself. While it’s good to improve the look of your bathroom and to upgrade its storage space, the most important features of every bathroom are the shower, bath, toilet, and sink, and all of them run on water. Fortunately, Cardigan Kitchens and Baths can help with that, too. When it comes to renovating your home, the lowest bidder isn’t always the best. Your house or condo is a massive investment, the biggest that most Americans make in their entire lives, and if you intend to spend money on changing it, you need to know that your contractor will complete the job competently and on time, and that the improvement will add and not subtract from the overall value of your home. As such, while keeping expenses down is important, the most important thing about a remodeling project is quality, including the quality of the materials and the products used in the project and the quality of the workmanship that goes into installing them. If you pay someone an unprofessional amount of money, you should expect that person to perform an unprofessional job. At Cardigan Kitchens and Baths, we constantly strive to provide the best custom remodeling jobs that anyone could ask for such as bathroom cabinet remodeling. This includes involving the customer in the design process to make sure he or she is getting exactly what he or she wants, using the best materials and procedures for the job, and providing an accurate estimate both in costs and in time before the customer has to commit to anything. If you think your bathroom needs an overhaul or an upgrade, and if you live in the state of Maryland, then please give Cardigan Kitchens and Baths a call. We’ve got the experience and the knowhow to help you design and build the bathroom you’ve always wanted.